It was really a kind of beautifully tragic turn of events, like Icarus flying too close to the sun. 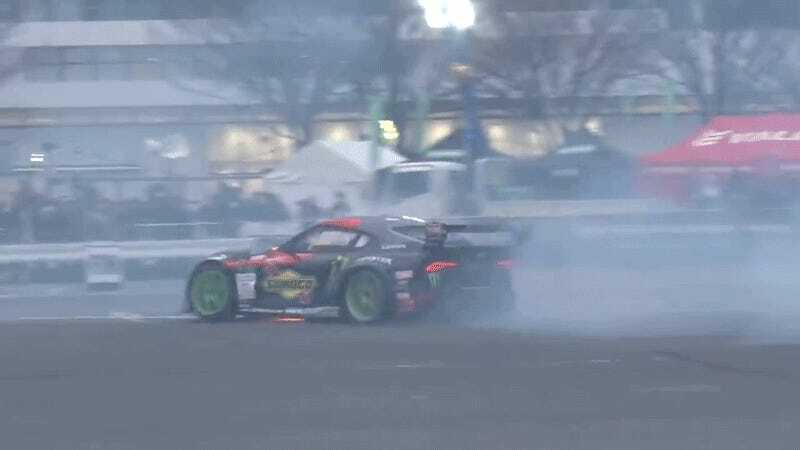 But instead of wings made of feathers and wax, we have a 2020 Toyota Supra powered by the legendary 2JZ and then a fire. Here’s a behind-the-scenes look at what happened. As a reminder, we first learned about drift champion Daigo Saito’s 2JZ-swapped 2020 Supra early last month. The car, for all intents and purposes, mobbed. And then, for whatever reason, the car gods saw fit to strike it down during a run at the D1GP All Star Shoot-Out at the end of March. Perhaps it was because they deemed it unholy. Maybe it was because they are sponsored by BMW. Anyway, a new video uploaded to the Video Option channel on YouTube includes close ups of the car and some commentary from the Supra’s team. It’s all in Japanese, by the way, so if you speak Japanese you’re in luck. Based on a very, very rough Google translation, the car seemed to have caught fire during a run in Saturday’s event. The fire can first be seen at the 7:37-minute mark. I don’t know a lick of Japanese, but Kotaku’s Tim Rogers does. He reported that the dry-sump was to blame and the power-steering oil caught fire. So, the team appears to have swapped in the original wet-sump and things worked after that. Ultimately, they could not get the dry-sump kit to work.